As discussed earlier (see post), home price increases in the US are slowing. One of the reasons for the slowdown is the continuing weakness in wage growth. The latest data seem to indicate that in spite of the overall improvements in job creation, wage growth remains subdued - hovering around 2% per year over the past 3 years or so. And wage growth is a key determinant in home price valuation. Merrill Lynch for example shows that current home prices may already be above where they should be, based on Merrill's "fair value" index (that is driven to a large extent by wages). The other issue holding back home prices from accelerating is credit. Credit conditions for mortgages remain relatively tight and in fact have worsened for non-traditional mortgages. 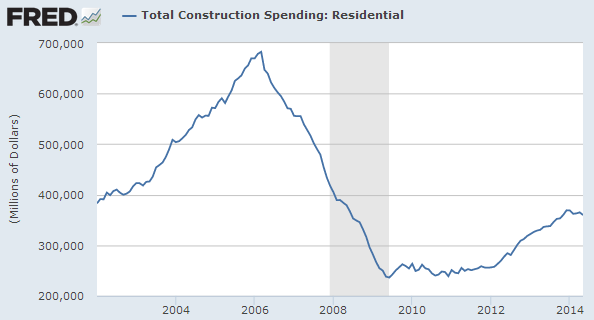 That's why it remains challenging for the housing sector to maintain momentum, as we see residential construction spending stall. Of course this is the situation for the nation as a whole. Underneath all this we have quite a bit of variability. Skilled workers are more likely to have higher paying jobs, are able to get mortgages, and are buying homes. House prices in certain areas are rising much faster than what we see in the national averages. In many cases there are simply not enough homes. Yet in other areas, the situation remains stagnant in terms of wages, credit, and the housing market. This divergence, although not visible at the national level, is growing.